After the snot-fest that was Aviemore, I’ve been feeling pretty bad. The cold has finally subsided, but ever since the run my right hip has been swollen, painful, and generally angry at me. I suspect that Aviemore alone was not the cause of this, because I distinctly remember my hip being in some discomfort during Loch Ness. After sports massage and physio, today is the first day where I have woken up without a hot throbbing in my groin (I know). While by no means perfect, it’s an improvement. I have been told not to do anything too strenuous by my physio until she gives me the all clear, which I’m hoping will be when I see her on Thursday, because if everything is behaving I’ll get to run the Culloden 17.46k on Sunday. It’s meant to be a tough course, but it’ll mark the start of my long run cycle for the Texas marathon (noticeably shorter than my other training cycles thanks to Loch Ness), and also the casual start of my Ultra base training. Anyway, my main focus from now until April is staying healthy, so that’s probably why I’m not going too crazy without my normal exercise regime. It’s a week or so out of action, but having an end goal let’s me see the bigger picture. Still, old habits die hard, and I have already spent hours lamenting the end of my running career after going on WedMD and looking at all possible causes of hip pain, just in case bruising and inflammation wasn’t what was wrong with me. Never do this. Because ‘cancer’ and ‘arthritis’ are not things you want to have floating around in your head when you’re stuck at home feeling sorry for yourself. *Do this when they are not watching you. This entry was posted in Injury and tagged if my family is reading this be thankful I didn't post the crotch shot with the hip tape, injury, running by MedalSlut. Bookmark the permalink. THAT CAR IS SO TINY TO BE STEALING TWO SPOTS!!! I have secretly been wanting a mini car lately… A fiat to be exact. Woof. Well, I thought I should probably try and get a driver’s license before I turn 30 next year, so I finally filled in the form and paid for my learner’s permit. I just need to wait for a few weeks for them to request ID, send it away, and them KABOOM! I can start taking lessons. The end goal apart from being able to drive myself (and others) to races for a change? A Nissan Figaro in mint green. Seriously, check them out. They’re freaking adorable. Oh. Also big supermarket shops. Because it would be nice to finish a big weekly shop without my fingertips turning blue from carrying a gajillion bags at once, and then realizing I somehow need to manoeuvre my hand into my pocket to get my keys to let myself in out of the torrential rain and gale force winds. That would be nice. THAT CAR IS AWESOME. how do you not have a license. That is impressive. Gosh I have spent THOUSANDS on cars, insurance, gas, I’m done my head is spinning. Well, I moved from the US to Venezuela before I did Driver’s Ed, so missed the boat there. My parents wouldn’t have let me drive in Venezuela, so I thought there was no point trying to get a license. Then I moved to the UK where you have to be 18 to drive, but also 18 to drink. Let’s all guess where my priorities were when I hit that milestone…. Oh, and re: the Figaro. I know, right?! Question: do you plan on running the Texas Marathon aggressively? You mentioned it in this post as a means to start your ultra high-mileage regimen, so I was going to see if you planned on running it conservatively so you can knock out runs within days of finishing instead of tackling your running log convalescently. In that situation I’d set a negative time, running in the other direction. Possibly a course record. I wonder if your pain is either ITBS or greater trochanteric bursitis? I used to think ITBS only manifested as pain around the knees, but it can cause pain in the hip too. If that’s the case, foam rolling? The bursitis is tougher, I think that’s what I’ve dealt with in the past. My physio adjusts my pelvis and spine, and I’ve iced my side too. Good luck! Looked up the bursitis, and it’s definitely not that – my pain is on the inside/groin area (see instagram if you REALLY need to pinpoint the area). My ITBs on both sides are fine as well, so I’m hoping that it’s just inflammation that takes time to go down. Way more time than I’d like, but hopefully not much longer. Being a couch potato in winter is too appealing as it is. While I agree with the principle of knee-jerk summary justice, I learned a useful lesson a long time ago – don’t judge people unless you know the constraints they were working within. Who’s to say the driver of that car wasn’t just squeezing in between two inconsiderate bastards who left earlier than him (or her)? Key the car anyway, ask these deep questions later. Good luck with your hip – I twisted my knee foolishly running in the dark without a torch and I have three trail races coming up, one of them my fell racing debut (Hexhamshire Hobble). I can’t do stairs at the moment. 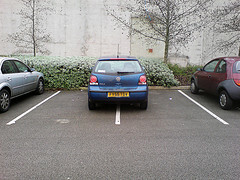 Ha ha, it could be other bad parkers, but for the sake of argument, let’s assume he (or she) is guilty. How long do you have before the trail races? And what sort of distances? Injuries should be illegal. I’ve decided to rest for a week then try a slow mile or so. Thank you! But I don’t feel very awe-inspiring after my DNS today thanks to feeling horrendous, but learning from my Aviemore experience that running sick is a bad idea. Hopefully my rest day today means I can still tackle my training this week, or at least not feel like death warmed up! I hope you feel better soon! Ah yes, Web MD. It’s so great yet at times can seem evil as it helps cause added stress and worriment. Try to avoid that until after you see your doctor. However, if you do end up having arthritis, don’t be scared. It is a common issue especially among athletes and it’s not too hard to treat. With a proper diet, exercise, and medication you will be able to relieve yourself from hip pain and go on running and doing all of the things you normally enjoy.